Be prepared for this simple bread to exterminate your hunger! It’s one of the fastest and easiest things to throw on your table for a Doctor Who viewing party. 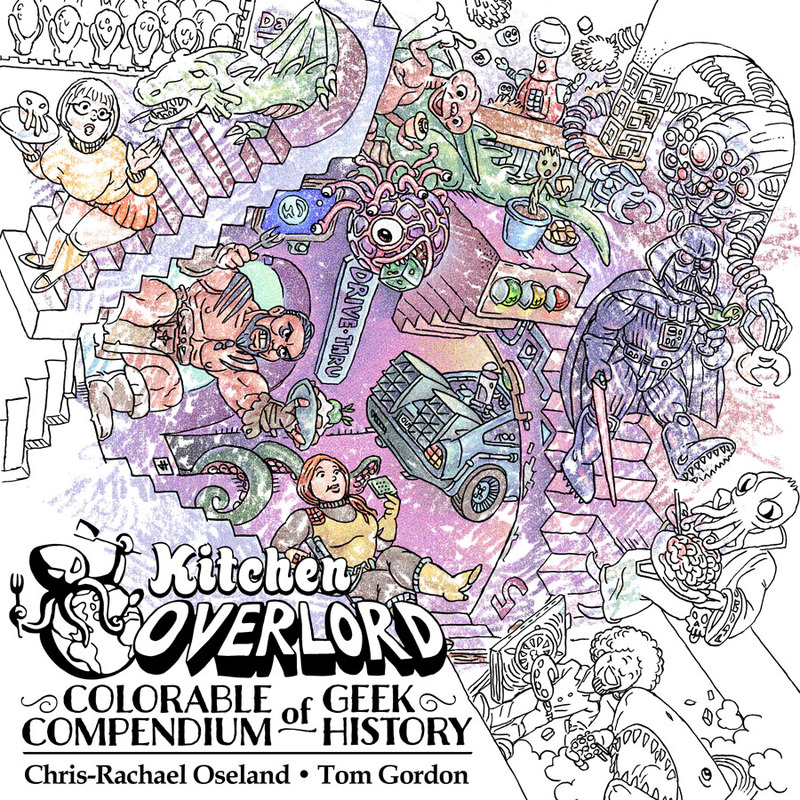 If you’re busy with more complicated recipes, this happens to be something you can safely hand off to drunks, children, or anyone with a pathological fear of the kitchen. Cut your baguette in half. Now you have two Daleks! Make 8 diagonal slices in each Dalek. Mix your butter, sugar, cinnamon, and salt. Spread the mix evenly inside each slice. Quickly dab the large chocolate chips on the hot bread to make the Dalek’s armor dots. Use the gumdrops for antenna. Use toothpicks to hold them in place. A Pocky Stick and a coffee stirrer make good arms. 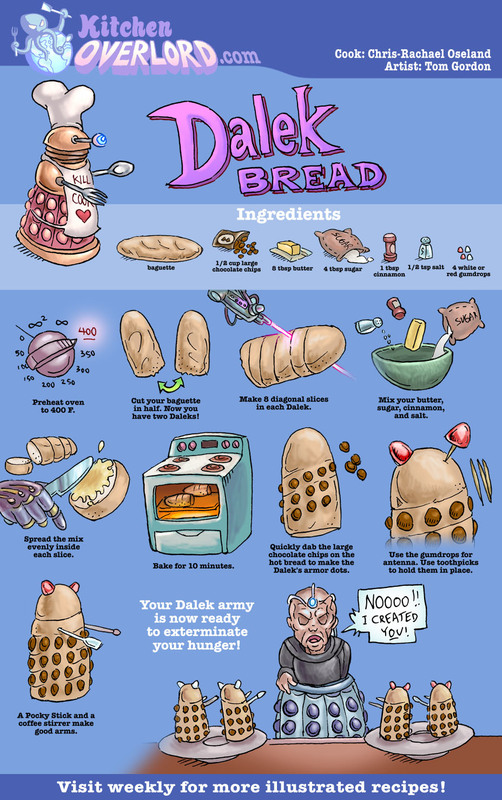 Your Dalek army is now ready to exterminate your hunger! 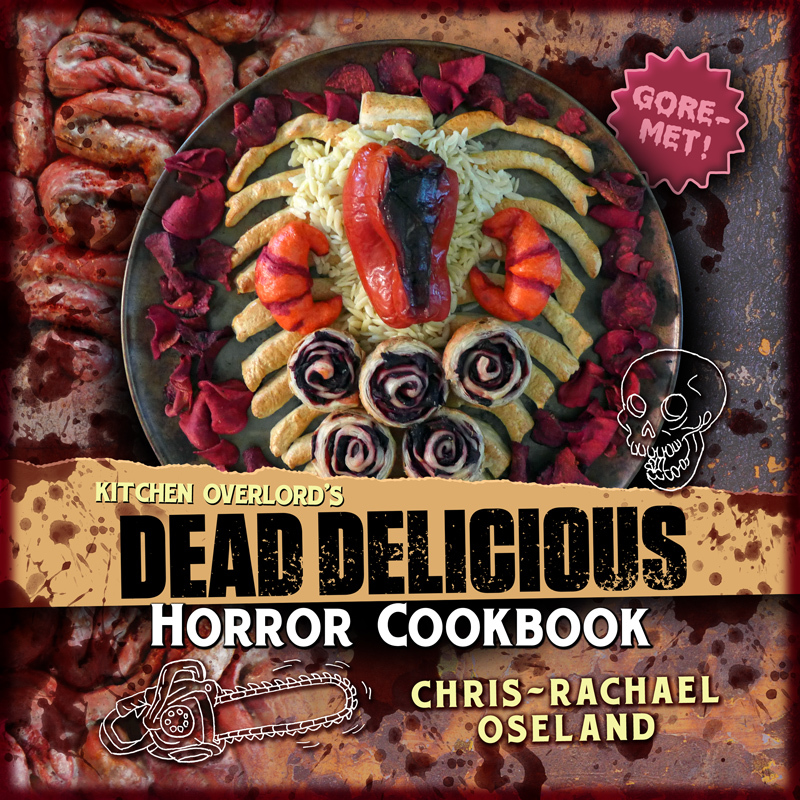 Preview these tasty morsels from Dining With the Doctor: Regenerated – now available for pre-order! Come back every week between now and the winter holiday season for a new preview recipe. How cute! 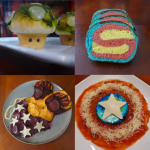 Sometimes I wish I had kids just to make truck loads of cute food like this for parties. Is it possible to change the cinnamon for another spice? Because i REALLY want to make these but I have a sibling allergic to cinnamon. Sure! She could try a mix of Nutella and raisins, if she’s into chocolate and fruit mixes. Alternately, she could try a filling of 1/4 cup butter with 1/4 cup orange juice, 1/2 cup sugar, and 1 heaping tsp orange zest for some totally spice-free orange filled bread. You could also try peeling an apple, slicing it thin, and cooking it in butter until soft. Dust the interior of each bread slice with nutmeg and alspice, sprinkle in some sugar, and stuff each one with a slice or two of apple so you have an apple stuffed (but non cinnamon filled) bread. I think this would also be really good as garlic bread with some kind of savory decorations…yum!! Totally! If you can find them at your craft store, the edible ball bearings (mentioned by the Eleventh Doctor as one of the things unique to humanity) make great Dalek dots. You can also char the surface with a creme brulee torch if you want to make bigger dots with no risk of them falling off and little impact on the garlic bread flavor. toothpick + mini marshmallow = eye stalk? It depends on the proportions of your mini marshmallows and bread. If you can find non-crunchy mini-marshmallows in the right size, that solution works really well.